Posted on 26, May 2016 by EuropaWire PR Editors | This entry was posted in Aviation & Aerospace, Construction, Germany, Italy, Science and tagged Astaldi, Cimolai, ESO, European Extremely Large Telescope, Luigi Cimolai, Paolo Astaldi, Tim de Zeeuw. Bookmark the permalink. 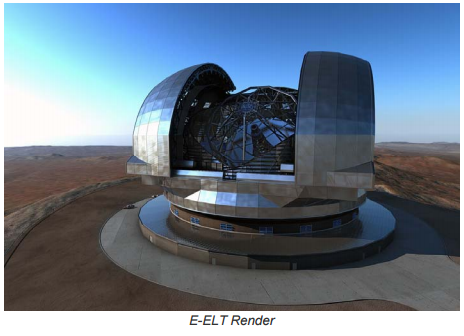 MUNICH, 26-May-2016 — /EuropaWire/ — The contract signing ceremony was held in Munich today for the design and development of the Dome and of the Main Structure of the E-ELT (European Extremely Large Telescope) to be built in Cerro Armazones, in Chile. Last February, the ACe Consortium, consisting of Astaldi (60%, lead company) and Cimolai (40%), with the EIE Group, was the Winning Bidder in the tender process initiated by the ESO (European Southern Observatory), and the contract signed today is the necessary final step towards starting up the development phase. The value of the works equals approximately EUR 400 million (with Astaldi’s share amounting to 60%). On hand for the official ceremony were Tim de Zeeuw, Director General of ESO; Paolo Astaldi, Chairman of the Astaldi Group; and Luigi Cimolai, Chairman of Cimolai. Also in attendance were Stefania Giannini, Minister of Education, Universities and Research of the Italian Republic; Renato Cianfarani, Italian Consul General in Munich; Patrick Roche, President of the ESO Council; Nicolò D’Amico, President of INAF and Italian delegate to ESO; Matteo Pardo, Science attaché of the Ministry of Foreign Affairs; and Gianpietro Marchiori, Chairman of EIE. The contract will result in the development of the largest ground-based optical telescope in existence today. The new telescope will be built in the central part of the Atacama Desert at an elevation of 3,000 metres above sea level, and will be the most important project launched to date by ESO. Its focus capability will be 100,000,000 times better than the human eye, and it will be able to gather more light than all the largest telescopes currently existing on the planet combined; their primary mirrors have diameters of 8-10 metres, against the 39.3 metres boasted by the new E-ELT. This is an important new success for the Astaldi Group, ranked among the world’s top-100 contractors and among the top-25 in Europe, and an established leader in Italy and abroad. The new contract also consolidates Astaldi’s presence in Chile, where the Group has been operating for about 10 years in transport infrastructure, energy production and mining plants, and hospital construction. In the country, Astaldi has also developed and currently operates a hydroelectric power plant (Chacayes, 111MW) and a mining plant for the recovery of metals from sludge (Relaves project); it also operates and is modernizing the largest airport in Chile (Arturo Merino Benitez in Santiago, 15,000,000 passengers/year); and it is building and will operate a major healthcare facility (Santiago’s West Metropolitan Hospital, 599 beds). Astaldi has also been engaged by CODELCO to carry out the works for the underground expansion of Chuquicamata, currently the world’s largest open-pit mine. ASTALDI GROUP is one of the leading General Contractors in Italy and one of the top 25 at a European level in the Construction sector where it is also a sponsor of project finance initiatives. It has been active for 90 years at an international level and is present on the market, developing complex and integrated projects involving the design, construction and operation of public infrastructures and large-scale engineering works, mainly in the following segments: Transport Infrastructures, Energy Production Plants, Civil and Industrial Construction and Facility Management, Plant Design and Management of Complex Systems. It has been listed on the Stock Exchange since 2002 and is 92nd in the list of global contractors. It ended 2015 with a total backlog of more than EUR 28 billion, including additional projects secured and being finalised, and a turnover of EUR 2.9 billion. It has approximately 11,000 employees in Italy, Europe (Poland, Romania and Russia) and Turkey, Africa (Algeria), North America (Canada and the USA), Latin America (Chile, Peru, Venezuela and Central America), the Middle East (Saudi Arabia and Qatar) and the Far East (Indonesia).